FOXBOROUGH, Mass. 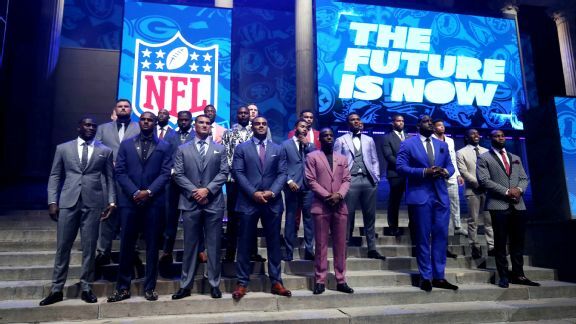 -- When New England Patriots coach Bill Belichick arrived at the interview podium late Friday night to discuss what unfolded with the team's initial two picks in the NFL draft, both in the third round, he instead took a big-picture view. "We've been watching a lot of picks go by, but I feel like overall our opportunity in this draft started a couple of months ago," he said. "The four players that we acquired already are also part of this draft process." Speedy wide receiver Brandin Cooks was acquired from the New Orleans Saints for a first-round pick (No. 32), a deal that held up well after Round 1. Defensive end Kony Ealy and a third-round pick (No. 72) came aboard in a trade with the Carolina Panthers in which the Patriots shipped out their late-second-round pick (No. 64). Tight end Dwayne Allen and a sixth-round pick (No. 200) were acquired from the Indianapolis Colts in exchange for a fourth-round pick (No. 137). And restricted free-agent running back Mike Gillislee was signed away from the Buffalo Bills in exchange for a fifth-round pick (No. 163). "Hopefully we've been able to improve our team, become more competitive," Belichick said, referencing those four players. "That's the ultimate goal." The Patriots, who have been trending toward "known value" over "not being sure" this offseason, usually prefer the draft picks, because they come with longer, more affordable contracts and help recycle the roster with crucial youth. In the past, owner Robert Kraft has called the draft the lifeblood of the team. The 2017 draft, in particular, is considered especially strong in the middle rounds, which further highlights the Patriots' different approach this year. If they ultimately make just five picks, it will be the smallest pure draft class of Belichick's 18 years with the team. But that's not the way Belichick is looking at things. When he analyzes the Patriots' 2017 draft class, it starts with Cooks, Ealy, Allen and Gillislee. Then add third-round picks Derek Rivers (defensive end, Youngstown) and Antonio Garcia (left tackle, Troy) -- two players identified in this space as good fits before the draft -- and whatever the club does with its three remaining selections, in the fourth round (No. 131), fifth round (183) and seventh round (239). One thought is that the approach has been specific to trying to maximize the final seasons of quarterback Tom Brady's career. Brady turns 40 on Aug. 3. But that might be overthinking it. This is probably as simple as the Patriots capitalizing on what they felt were unique opportunities in a year in which they had abundant salary-cap space, cash to spend, and a roster that trended young already. It's been different, no doubt, with Belichick making sure to note that he views Cooks, Ealy, Allen and Gillislee as much a part of the '17 class as the picks themselves.